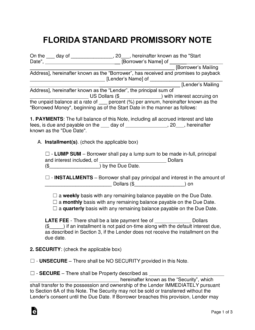 The Florida promissory note templates are a set of documents utilized by two (2) parties and are designed to ad structure and security to a loan transaction. Built into the documents include sections that allow the parties to decide on payment types, late fees, the final due date, and several other options. For the agreement to go into effect, a witness will need to watch the signing of the document by the lender and borrower. 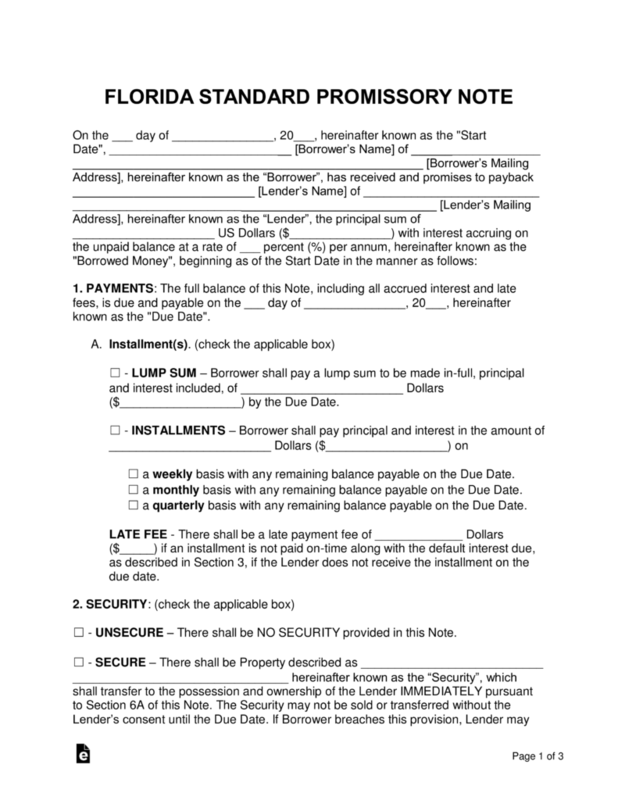 Secured Promissory Note – Includes security, which grants the lender the borrower’s property, a vehicle, or another worthy object if the borrower defaults on the balance. Unsecured Promissory Note – Does not include security, hence the word ‘unsecured’. Because of this, the lender should take extreme care when deciding on who to loan money to. If the borrower were to default on the balance, the lender has no direct way to be reimbursed his or her money, but has to resort to bringing the borrower to small claims court and/or filing the default on the borrower’s credit. Florida statutes place an upper limit on the allowed interest rate at 18% per annum simple interest for any amounts loaned under $500,000 and 25% per annum simple interest for any amounts loaned over $500,000. See Florida Statutes Title XXXIX Ch. 687.03 and Ch. 687.071.